Step into the rainforest and play the animated 3 reel Monkey Paradise Slots at Vegas Spins! Follow the wild monkey to an exciting jungle bonus round to multiply your wins and hunt down, FREE spins and jackpot prizes! Dive into the rainforest and play Monkey Paradise Slots at Vegas Spins, to go bananas for wild jackpot prizes. This classic 3 Reel animated production is set in a fruit-filled jungle paradise, and boasts realistic and stunning graphics and endearing monkey-themed animations. 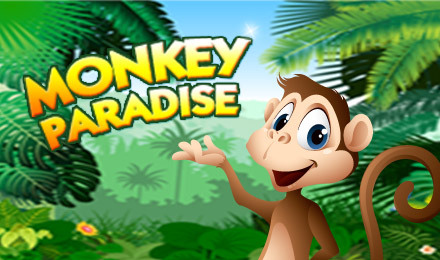 When you enter the paradise, you’ll be welcomed by an entertaining collection of cartoon monkeys, friendly ladybirds, frogs, coconuts and delicious bananas. If the Wild monkey leaps onto the grid, he can lead you to the exciting Jungle Bonus round where you can pick coconuts for prizes, FREE spins and multiply your wins by up to 200. So make sure you join the adventure, so you can follow the trail to huge paradise jackpot riches!